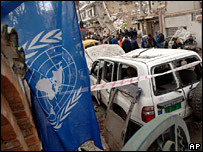 Seventeen UN employees are now known to have died in Tuesday's two car bombings in Algiers, the UN has said. The new confirmed toll, which had previously stood at 11, was announced by UN spokeswoman Marie Okabe. More than 30 people died in the attack on UN refugee agency office and a court building in Algeria's capital. Al-Qaeda's North African wing said it carried out the attack - the deadliest on the UN since 2003, when 22 were killed by a bomb in Baghdad. In an unverified online statement, a group calling itself al-Qaeda in the Land of the Islamic Maghreb (AQLIM) said two vehicles packed with 800kg (1,700lb) of explosives each were used in the blasts. The group labelled the UN buildings an "international infidels' den" and called on Western leaders to "heed the demands of al-Qaeda leader Osama Bin Laden". There have been a series of bomb attacks across Algeria during the past year in which scores of people have died. In September, more than 50 people were killed in suicide attacks - one of them involved a lorry packed with explosives being driven into a coast-guard base. Many of the recent blasts were also claimed by AQLIM, including a triple suicide bombing in Algiers in April which killed 33 people. Algeria suffered a brutal and bloody civil war in the 1990s, but in recent years violence has declined.